There are several surveillance systems that’s compatible with the Mac computer. You should be able to find an Internet protocol security system that meets your needs. Internet Protocol security systems allow you to view the images from your Mac computer. 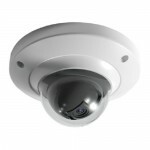 The Y-Cam White SD surveillance camera is compatible with a Mac computer and packed with features such as the ability to monitor your cam directly from your cellphone. This security camera has a built-in microphone that gives you audio capability allowing you to hear sounds around the camera while monitoring the video. The built-in recording equipment goes directly into a Micro SD card. This feature eliminates the need for additional recording equipment. Wireless Internet connectivity is built into the camera, so you don’t have to worry about connecting Ethernet equipment. Software is included that allows up to 36 Y-cams to be connected. Another helpful feature of the Y-cam is that you can set the camera to record for motion detection or on a schedule. The camera can be used as a baby monitor, keep an eye on pets or it can monitor someone in the home that isn’t feeling well. You can mount the camera on the wall, desk or ceiling. The sleek, compact design allows the Y-cam to be hidden discretely in your home. The camera is easy to set up, making it perfect for novices. The Panasonic BL-C10 surveillance camera is compatible with the Mac computer. This mini camera has motion detection, one-way audio and an external input connector. This mini camera makes it perfect for home or office security. The camera features a Color Night View mode that makes it easier to see in low-light environments. The camera is affordable and has an interface that is easy to use. It also has remote viewing capabilities from anywhere in the world using a PC, Internet connection or smartphone. The camera has wireless connectivity without the use of Ethernet cables. Compatible recording platform that works with Security Spy software for Mac users. The PoE power transfer unit uses the Ethernet connection for its power needs. The camera can be set up with no conventional means of power. The external input connector allows you to plug in alarm-based triggering devices. This is helpful when you want to add triggering sensors to windows and doors. The camera can be used to monitor pets, babies or anyone in the home. The Axis M1031-W surveillance camera comes with an integrated PIR sensor that will detect movement even in complete darkness, and is compatible with Mac computers. When the sensor detects movement, an LED light illuminates the focus area while recording. This feature makes it perfect for small businesses or office security. The camera has two-way audio recording allowing for interaction between the viewer and the recording location. Everything you need to view live images on a computer is included. The camera comes with a microphone, speaker and software that is compatible with Security Spy software found on the Mac computer. The camera uses wireless connectivity without the use of Ethernet cables. Video can be viewed and stored efficiently with video compression. The Panasonic BL-C140 outdoor surveillance camera is equipped with 10x digital zoom, and is compatible with Mac computers. The camera features a casing that is ready to be mounted outdoors. It is perfect for monitoring garages, driveways or anywhere in your home. The power transfer unit uses the Ethernet connection to power the camera. Alarm management features allow the camera to send images via FTP or email when the alarm has been triggered. The interface is easy to use and you can set the camera to be triggered by movement or periodic transfer. This surveillance camera can be used both indoors and outdoors. You can monitor the live video from any computer with an Internet connection. The recording platform is compatible with Security Spy software found on Mac computers. The power transfer unit makes it possible to place the camera in any location of the home or office. The Y-Cam Bullet HD is compatible with Mac computers, and features the high-definition version of the Y-Cam Bullet VGA camera. This surveillance camera is for applications that require an image of greater detail. This feature is also helpful for identifying people. The camera can switch from full-color to black and white night vision in complete darkness. Camera features include HD 720p video quality with 30 frames per second with one megapixel resolution. options. Two-way audio allows communication between user and field of vision. This camera is perfect for home use, but can also be used in restaurants, hotel lobby’s and parking lots. The Micro SD card is sold separately and allows video to be stored on the security camera. Video surveillance equipment takes advantage of wireless technology and offers the latest wireless cameras. These cameras have a built-in transmitter that sends video signals over the air directly to a receiver. The wire camera systems transmit signals through the use of wire technology. You’ll find multiple types of wireless technology devices that each offer pros and cons. Most wireless cameras work by being plugged into a power source. Some cameras operate with battery packs only. Battery powered cameras last only a few hours before they need to charged again. These types of cameras have a built-in wireless radio transmitter. The transmitter sends the camera’s video and is picked up by the receiver. The receiver is connected to a recording device or a monitor. There are receivers with built-in storage capabilities, and some cameras must be connected to a digital video recorder or DVR. The two basic types of radio transmission signals are analog and digital. Analog signals can be picked up by any receiver that is tuned to its frequency range. This simply means that anyone with a tuner that is properly tuned can pick up the transmission. Analog systems have frequent interference problems. When there are multiple transmitters, the transmitter with the most powerful signal will be the only one that will pick up the signal. Digital signals are more secure because they cycle their frequencies to avoid interference problems. A receiver must be paired with a camera in order to pick up the video feed. They have to be programmed to cycle through frequencies at the same rate of speed. A WiFi camera that is wireless uses Internet protocol cameras, otherwise known as IP cameras. These cameras enable multiple devices to be networked together. A local area network is established through a wireless router. These devices allow the camera to access the local area network. The WiFi router must have the bandwidth to support multiple devices. Some home surveillance systems don’t come with a router, and you must purchase it separately. The ability to offer remote access makes these WiFi systems very popular. 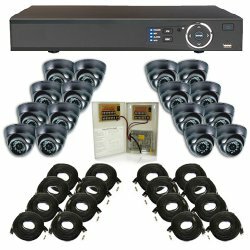 Installation can be difficult and it is suggested that you hire a professional surveillance company. Trying to set the system up by yourself can cost you valuable time. It is important that the installation is done properly in order for the system to work. 3G cameras have a built-in cellular transmitter making it possible to install a cellular camera. The cellular camera will connect to a cellular network in order to send video. They are similar in function as WiFi camera systems. Their reliability depends on the strength of the cellphone company’s network. You will need to purchase a special cellular data plan in order for this method to work. The cellular system’s equipment is also expensive. Video surveillance cameras are an important part of a home security plan. However, installing outdoor surveillance equipment will improve your home security. Outdoor cameras are installed near doors and windows. They can also be installed near garage doors. Outdoor security cameras can make a potential intruder rethink their plans about breaking into your home. If you don’t want to go to the expense of installing outdoor surveillance cameras, you can choose the popular dummy cameras. These cameras look real and can fool a potential intruder. You could combine real security cameras with dummy cameras to enhance the look of security to your home. Some fake cameras are equipped with LED lights that are hard to detect from real home security cameras. Wireless driveway security systems are good for adding an additional security layer to your home security plan. The system will monitor the driveway by detecting movement. This system includes a transmitter and receiver that works together. There are some systems that detect heat instead of movement. The transmitter picks up movement or heat and sends a signal to the receiver. You can program the system to sound an alarm when triggered. Door and window alarms can sense movement or glass breakage. These systems will sound an alarm when triggered. Doorstop alarms will go off if the door is opened. These alarms are useful for families who have a backyard swimming pool and small children. Door and window alarms are available in both wire and wireless versions. Wireless alarms are more popular because they are easy to install. The rise in home burglaries has caused more homeowners to install an alarm system in their homes. You can purchase simple alarm systems that are easy to install. However, to install a complicated security system, you will need the advice of a professional home security company. Fire alarm sensors can be installed throughout the home to alert your family if smoke is present. Medical alarm sensors are used in homes that have small children, elderly or disabled people. Medical alarms are used in some homes to notify emergency personnel directly. Most home security alarm systems utilize wireless technology. Remote viewing capabilities allow you to view video feeds in real-time. Some systems have two-way communication capabilities. These systems are convenient because they allow direct communication with both parties. The number of alarms installed in your home will depend on your home security plan. Go through your home with a video camera and document your belongings. If an intruder breaks into your home, you will have documented evidence of the items that are missing. It can be hard to remember every single item in your home without documentation. Keep the video updated when you make new purchases, especially electronic devices. Home video evidence is required by some home insurance companies. Keep an extra video copy in your safe deposit box or with a trusted friend or neighbor. Most intruders want to hide under the cover of darkness or your landscaping. An intruder can break into your home with the cover of a wood privacy fence. Keep your landscape trimmed back, especially around doors and windows. Install strong outdoor lights that come on when they detect motion. You’ll also find solar outdoor lighting to save money on utility bills. Place a sign on your privacy fence warning strangers about the presence of a dog. Dogs are a deterrent to many intruders. Your dog doesn’t have to be an aggressive breed in order to be effective. Small dogs do a good job of barking and intruders don’t like barking dogs. Installing an effective home security surveillance system involves a lot of planning. Consulting with an experienced home security specialist will help you decide which security system is best for your home. Combing all of the security techniques will improve the security in your home. Cost is an important consideration but you will find a security system that meets any budget. You don’t have to spend a lot of money for your home to be secure from intruders. The first step is to decide how many layers of security your home needs. Write out your home security plan on paper. There is a wide range of security devices to accomplish your security goals. Search online for home security product reviews to learn what other people have to say about security products.